From our ears to yours. We're very excited to announce that, starting tomorrow, Shelf Awareness is sponsoring the Selected Shorts podcast on NPR. A co-production of Symphony Space and WNYC, New York Public Radio, the hour-long programs feature stars of stage and screen reading short fiction and are recorded live at Peter Norton Symphony Space in New York City and on tour. 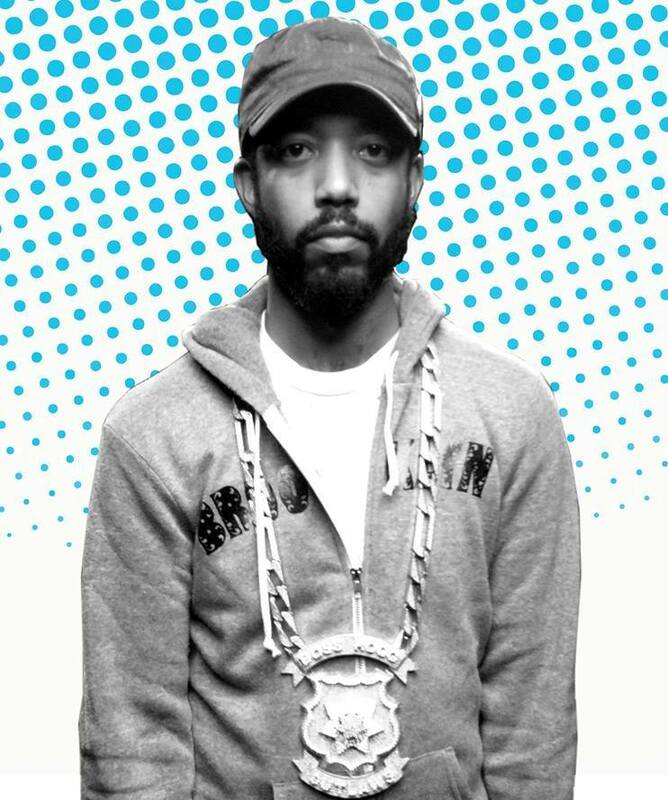 Comedian Wyatt Cenac, one of the guest hosts for Selected Shorts, has recorded promos for Shelf Awareness that will air during each show. 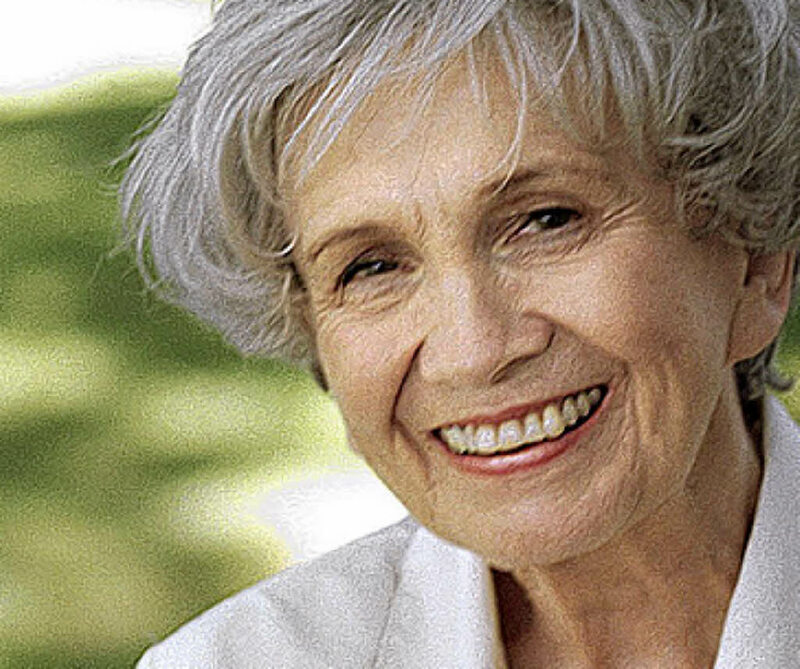 The 2013 Nobel Prize in Literature has been awarded to Canadian author Alice Munro, "master of the contemporary short story," according to the citation read by Peter Englund, permanent secretary of the Swedish Academy. In an interview after the announcement, Englund said, "I think no one has better deconstructed the central myth of modern romantic love; not just saying it means this or means that, but showing that people can feel very, very different things about it.... She is a fantastic portrayer of human beings." Regarding the 82-year-old Munro's recently announced retirement from the writing life, Englund said, "What she has done is quite enough to get a Nobel Prize. If she wants to stop, that's her own decision." The New York Times reported that although "winners are traditionally notified by phone in the hour before the announcement, the Swedish Academy was unable to locate Ms. Munro, according to the Twitter account for the Nobel Prize. It left a phone message instead." Munro's books include Dear Life; Hateship, Friendship, Courtship, Loveship, Marriage; Runaway; The View from Castle Rock; Something I've Been Meaning to Tell You; Selected Stories; Too Much Happiness; The Love of a Good Woman; Lives of Girls and Women (all published by Vintage) and more. The Guardian reported yesterday that "short story supremo" Munro had made "an eleventh-hour leap to become second favorite" at 4-1 to win this year's Nobel, placing her just behind Haruki Murakami and ahead of Svetlana Alexievich, Joyce Carol Oates and Peter Nadas. "Normally we have four or five CEOs," said Holger Volland, v-p of conferences and creative industries at the Frankfurt Book Fair, as he introduced this year's CEO Panel. "But now," said Volland, laughing, "Markus Dohle is equal to five CEOs." 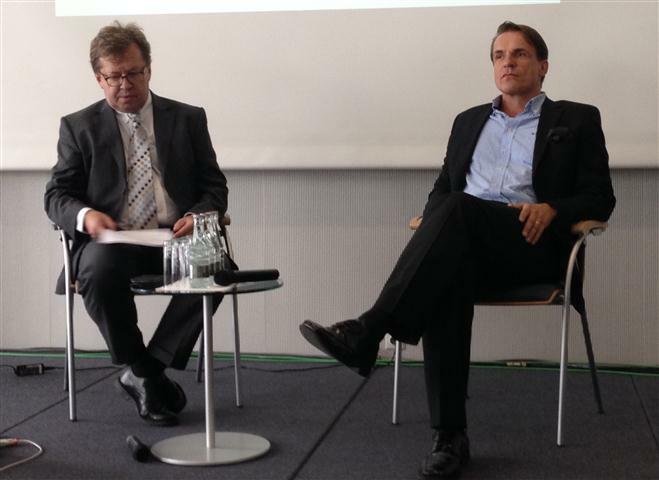 Ruediger Wischenbart (l.) interviewing Markus Dohle. Publishing consultant Ruediger Wischenbart acted as moderator as journalists from international trade publications took turns asking questions of Dohle, CEO of Penguin Random House. Among the first questions: How could a company as large as the new Penguin Random House remain nimble in a constantly changing environment; at what pace will the two companies merge their systems and operations; and how does Dohle keep outside distractions (such as fallout from the Department of Justice e-book collusion case) from interfering with the merger? "Size is actually not a value in and of itself," Dohle answered, maintaining that the value of size comes from the ability to leverage innovation across many markets and to set industry-wide standards. He described Penguin and Random House as "two communities of small and medium sized publishing houses" that had grown large through years and years of mergers and consolidations. The task at hand, Dohle stated, is uniting those communities into one while preserving the "small company feel" on the author and agent side of the business. He stressed that the day-to-day business of both companies--"bringing our books to as many readers as possible"--will not change. "I want to make it a very smooth, very quiet landing," said Dohle, on integrating the two publishing companies. "I want to make it hard for people to notice that we've closed the deal." With a faux apology to the journalists present, he added: "I want to make it the most boring merger in the history of corporations." Several questions concerned the danger posed by online retailers such as Apple, Google and especially Amazon. Asked if even the gigantic Penguin Random House was large enough to compete with Amazon, Dohle demurred, suggesting that the relationship was not necessarily doomed to be an antagonistic one. "The fundamental idea of what retailers want and what we want as publishers is aligned. The rest is just drama around it," insisted Dohle. "Online retailers brought a lot of innovation into the industry.... They've expanded the market. They need our content; we need their access to readers. It's a clear win-win situation." Although he acknowledged the need for publishers to experiment with new business models, Dohle also offered steadfast support of the printed book. "[One of our] basic strategic assumptions is that print will always be important," said Dohle, explaining that print books make up 80% of Penguin Random House's business worldwide. "Basically, we are saying that even 100 years from now, the print business will be a big chunk of our business. It doesn't matter if that's 50%, 60% or even 40%; it will always be a big chunk." While other publishers have been running away from print in droves, Dohle said, Penguin Random House is still investing in the medium. He plans to create competitive advantages in both the print and digital markets, and declared that two of Penguin Random House's next "clear tasks" are helping to sustain physical retailers and to "crack the code of discoverability" in a world with fewer bookstores. Dohle was emphatic when asked if publishers can survive long-term without essentially becoming booksellers. "The transaction is not our core goal," replied Dohle, mentioning that he was not a "fan" of vertical integration. "Our goal is to crack the code of discoverability in a world of fewer bookstores. We want [consumers] to choose books in the future, not Netflix. That is a big task. Cracking this code... will create the relevance for publishing going forward. I truly believe we will be relevant in 100 years from now." The American Booksellers Foundation for Free Expression is defending bookstores that have scheduled appearances by Stephen Jimenez, author of The Book of Matt: Hidden Truths About the Murder of Matthew Shepard (Steerforth Press). The book has been criticized for questioning aspects of a case that came to symbolize the problem of crimes that target gay men and women. 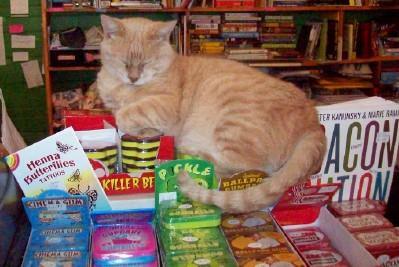 On the TalkAboutEquality.com blog, Jamie McGonnigal had suggested that the 23 bookstores with scheduled events cancel them and urged supporters to call the booksellers. He also started a petition on Change.org addressed to booksellers that said: "The fact that you are hosting this conspiracy theorist and LGBT hate crime denier on 15th anniversary of Matthew's gruesome murder only confirms the fact that you are in it only for the book sales." In a letter sent to McGonnigal, ABFFE president Chris Finan said that the protest "demonstrates a poor understanding of bookselling and has the potential to stifle discussion of a significant historical event.... The most mistaken notion about author appearances is that providing a forum for controversial authors always 'sells books.' Controversial ideas inevitably alienate some people, and when those people include some of our customers, we can lose business. While we do not wish to offend anyone, we cannot allow a minority to censor either the books we sell or the authors we host." ABFFE noted that no bookstore has canceled an event with Jimenez, who appeared last night at Politics & Prose, Washington, D.C. "Citizens must have opportunities to hear diverse and sometimes divergent views and to engage in respectful debate about them, even if those views are controversial," co-owner Bradley Graham had written to McGonnigal. Denver's Tattered Cover Book Store has also refused to cancel. "It has been the belief of the Tattered Cover since its inception that it is in the best interest of our society that ideas of all kinds be allowed to flow freely to the individuals who seek them, regardless of what our own personal choices or tastes might be," said general manager Matt Miller. After 42 years in the business, Archie and Pat Kutz, co-owners of Lift Bridge Book Shop, Brockport, N.Y., "are ready to retire and are looking for a serious buyer," the New Atlantic Independent Booksellers Association's NAIBAhood News reported. The owners noted that Lift Bridge, which opened in 1972, "remains a family owned and operated independent bookstore. It is located in downtown Brockport, a Victorian village on the Erie Canal, in beautiful Western N.Y. State, not far from Rochester. Lift Bridge is a healthy enterprise with lots of opportunities, even in this day and age of high-speed Internet commerce." For more information, contact the owners at 585-637-2260; akutz@liftbridgebooks.com or patkutz@liftbridgebooks.com. 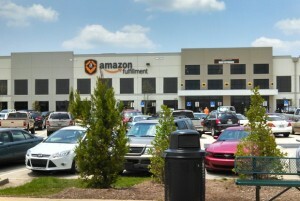 Fourteen workers at the Amazon fulfillment center in Murfreesboro, Tenn, have accepted offers to resolve claims from a federal lawsuit they filed last month "concerning unpaid time spent on security screenings accepted offers today to resolve their claims," the Tennessean reported. The plaintiffs had maintained they were required to complete security screenings after punching out that could take more than 10 or 15 minutes of unpaid time. The settlement payments from defendants Amazon.com and staffing agency SMX LLC, which operates at the facility, "range from $252 to $5,808, depending on how long each employee worked at the facility," the Tennessean wrote. Stanley Kauffmann, "whose literate, tightly constructed movie reviews appeared in The New Republic for more than half a century and set a standard for critical ease and erudition," died Wednesday, the New York Times reported. He was 97. His film criticism was collected in several books and he also wrote novels, many of them "while he was an editor at Bantam Books, where he discovered the Walker Percy novel The Moviegoer, and at Ballantine Books." 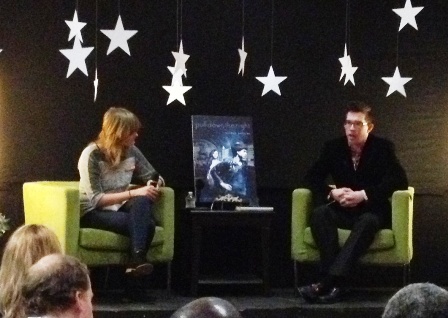 Linnie Greene, marketing coordinator at Flyleaf Books, Chapel Hill, N.C., interviewed local author Nathan Kotecki to kick off Tuesday night's launch celebration for Pull Down the Night (HMH Books for Young Readers), the second novel in his Suburban Strange YA series. "The theme was, of course, 'Pull Down the Night,' hence the 'falling' stars from the ceiling and the black backdrops and low lighting," noted Flyleaf's owner Jamie Fiocco. "Nathan is an architect by day but is a former DJ and his books always have great tie-ins to songs and design." Posted on Facebook yesterday by Broadway Books, Portland, Ore.: "Ok. I'm PRETTY sure this is a first for us. Got a call today from a woman who wanted to know if we had a certain book. Yes. Shall we hold a copy for you? 'Yes. What is your address?' Gave her directions. About 30 minutes later she calls again and speaks with my colleague, again seeking directions. About 30 minutes after that she calls again and I answer. 'Are you in Portland, Oregon?' she says. I respond in the affirmative. 'Oh that explains it,' she says. 'I'm in Portland, Maine. You can stop holding that book for me.' "
At least two independent bookstores have reached the second round of Intuit's Small Business Big Game contest, which offers a grand prize to the winning small business of a free commercial during halftime of this year's NFL Super Bowl. Check out the entries submitted by From My Shelf Books & Gifts, Wellsboro, Pa., and Reading Rock Books, Dickson, Tenn. The 2014 Bare It for Books calendar, featuring "highly respected and established Canadian authors" baring it all for a good cause, is now available, with proceeds going to PEN Canada. On the calendar website, organizers Amanda Leduc and Allegra Young wrote: "We found, to our everlasting delight, that established authors were more than willing to disrobe for the sake of books. We put the word out and found a host of hugely creative, enthusiastic, and lovely people who were willing to help Bare It For Books become a reality." Authors featured on the 2014 Bare It for Books calendar are, in monthly order, Angie Abdou, Trevor Cole, Farzana Doctor, Dave Bidini, Miranda Hill, Steven Heighton, Yasuko Thanh, Terry Fallis, Sachiko Murakami, Vincent Lam, Saleema Nawaz and Yann Martel. The Eye of Minds (The Mortality Doctrine) by James Dashner (Delacorte), from the author of the Maze Runner series. Tomorrow on Rachael Ray: Jessica Seinfeld, author of The Can't Cook Book: Recipes for the Absolutely Terrified! (Atria, $27.99, 9781451662252). Tomorrow on NBC's Steve Harvey Show: Al Sharpton, author of The Rejected Stone: Al Sharpton and the Path to American Leadership (Cash Money Content, $22, 9781936399475). Tomorrow on Tavis Smiley: Eric Schlosser, author of Command and Control: Nuclear Weapons, the Damascus Accident, and the Illusion of Safety (Penguin Press, $36, 9781594202278). Tomorrow on CNN's Anderson Cooper 360: Stephen Owens, co-author of Set Free: Discover Forgiveness Amidst Murder and Betrayal (B&H Books, $14.99, 9781433680236). Tomorrow night on HBO's Real Time with Bill Maher: Chris Matthews, author of Tip and the Gipper: When Politics Worked (Simon & Schuster, $29.95, 9781451695991). Book TV airs on C-Span 2 this holiday weekend from 8 a.m. Saturday to 8 a.m. Tuesday and focuses on political and historical books as well as the book industry. The following are highlights for this coming weekend. For more information, go to Book TV's website. 8:30 p.m. Walter Echo-Hawk, author of In the Light of Justice: The Rise of Human Rights in Native America and the UN Declaration on the Rights of Indigenous Peoples (Fulcrum, $19.95, 9781555916633). Beneath the Darkening Sky by Majok Tulba (Oneworld). Ulysses S. Grant: The Unlikely Hero by Michael Korda (Harper, $35, 9780062279774) is an illustrated version of this biography by the former editor-in-chief of Simon & Schuster. Identical by Scott Turow (Grand Central, $28, 9781455527205) follows identical twins, one a state senator, the other a convicted murderer. "When Did You See Her Last?" by Lemony Snicket and Seth (Little, Brown, $16, 9780316123051) continues the All the Wrong Questions series. Johnny Carson by Henry Bushkin (Eamon Dolan/Houghton Mifflin Harcourt, $28, 9780544217621) is the biography of the longtime Tonight Show host. Wheelmen: Lance Armstrong, the Tour de France, and the Greatest Sports Conspiracy Ever by Reed Albergotti and Vanessa O'Connell (Gotham, $27.50, 9781592408481) explores Armstrong's doping downfall. The Lion Seeker by Kenneth Bonert (Houghton Mifflin Harcourt, $28, 9780547898049) follows a Lithuanian Jewish immigrant in Johannesburg during World War II. Christmas Bliss by Mary Kay Andrews (St. Martin's Press, $16.99, 9781250019721). Christmas in Savannah. JFK, Conservative by Ira Stoll (Houghton Mifflin Harcourt, $27, 9780547585987) posits that President Kennedy was more conservative than liberal. LIFE: The Day Kennedy Died: Fifty Years Later: LIFE Remembers the Man and the Moment by the editors of LIFE (Life, $50, 9781618930743) includes photos and essays. Apocalypse is at hand, and it's up to Roen Tan and his alien companion Tao to save the day. In The Deaths of Tao, the sequel to Wesley Chu's comedic, action-packed debut, The Lives of Tao, matters have taken a dark turn. When The Lives of Tao ended, Roen had saved and married Jill, the woman of his dreams. But global conflict takes a toll on a relationship, and as the sequel opens, Roen and Jill are separated, and their son, Cameron, is living in another state with Jill's parents. Both Roen and Jill are engaged in the battle to save humanity from the alien Genjix--Roen as a renegade, Jill as a political operative in Washington, D.C.--and the intense pressure has exploded their family ties. But Roen still keeps watch over Jill in her missions, and Cameron is always at the forefront of his mind. In The Deaths of Tao, two alien factions are battling for the fate of humankind. The Prophus--the faction to which Tao belongs and which is served by Roen and Jill--aim to propel the technological progress of humanity to a level at which it becomes possible to return the aliens back to their home planet, from which they have been exiled on earth. Until now, the opposing Genjix have sought to promote progress, too, but through a philosophy that warfare facilitates innovation--thus, their goal has been to incite global conflict. Now, however, the Genjix no longer want to return to their home planet. They have discovered that global warming would make Earth hospitable to their kind--and are on the way to making it happen. Roen's desperate mission to stop the Genjix sends him to Taiwan, where myriad battles ensue as Prophus armies clash with those of the Genjix. Aided by her own alien companion, Baji, Jill strives to stop the Genjix through political channels. In the foreground of these conflicts is the bittersweet tangle of their relationship, which shows all signs of being viable despite the battering it has endured. Shelf Talker: The fate of humanity hangs in the balance in a suspenseful and humorous novel replete with gun battles in East Asia and political machinations in Washington, D.C.